Adding appropriate alternate text to images on web pages is one of the most important accessibility techniques that site owners or developers can employ. This alternate text is used by screen readers and other assistive technologies to allow blind and other disabled users to understand the significance of images on web pages. The meaning or function of the image will be lost if the alternate text is not set correctly. This post presents a detailed guide to best practices for writing and implementing appropriate alternate text for images. We start by looking at why alternate text is important. 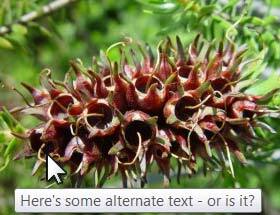 Then, on the second page, we show how to add alternate text to images on web pages. After that on the third page, we discuss what to use as alternate text in various situations. What is Alternate Text and why is it important? Most web pages contain images. Sighted users will generally understand what an image contains and what it represents without thinking about it. However users with visual impairments may not be able to see the image at all or see it clearly enough to determine its purpose or meaning. Alternate text is a method for conveying the contents and meaning of an image. It is voiced by screen readers, accessible to braille displays, and should also be displayed on an ordinary browser screen if images are unavailable or switched off. An absence of alternate text or inappropriate alternate text can prevent users from fully using certain sites.